As I sit here at the computer trying to force myself to come up with this month’s article I have a million things running through my mind. The big question is where do I begin? As reported last month, on May 20th, 14 Charter members signed the Charter Application to organize Groton Community Grange. On June 17th the new officers were installed, and June 18th the Charter application was filed. History is born. We currently have 3 Granges that are real close to organizing Junior Granges, with a fourth in the discussion stage. History is born. On June 1st Katie Molodich was elected Vice President of the CT FFA, Congratulations Katie. History is born. Many Granges have been reporting bringing new members, for these new Grangers, history is born. Each of these Granges and Grangers has nothing but opportunity ahead of them. Will they encounter challenges? YES. Will they need to alter their course from time to time just to stay on course? YES. They are all entering into a new and unchartered area they have never been in before. There is little to nothing that can or will hold them back if they set their minds to it. They each have the opportunity to be are true pioneers. These events and members are significant and deserve great praise, CONGRATULATIONS to each of you. Every Grange and every Granger has these opportunities every day. When was the last time your Grange made a difference in your community? 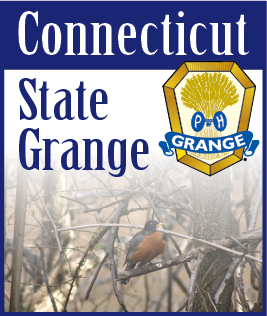 When was the last time your Grange engaged all of its members in a brainstorming session on developing ideas around advancing your Grange in the community. When was the last time your Granges leadership offered opportunities to its members to develop their personal leadership skills or challenged you to come out of your comfort zone to undertake a task or project? When was the last time your Grange held a membership drive with goals and targets? As we develop our programming for the coming Grange year, think BIG. Let’s challenge every member to “make” history in the 2013/2014 Grange year.